To provide for the needs of the aged poor, Saint Jeanne Jugan walked the roads of Brittany seeking alms. The Hospitaller Brothers of Saint John of God had introduced Jeanne to the practice of the begging. Like them, her vision of family extended far beyond those with whom she shared her life. She sought to involve people from many walks of life in her mission of hospitality, gratefully accepting whatever they could contribute in time, treasure or talent. In fact, so trusting was Jeanne in the Providence of God and the goodness of others that, in her old age, she intervened at a decisive moment in our history to ensure that the Congregation would never accept guaranteed forms of income. To do so, she felt, would betray our trust in Providence. That is why, to this day, we do not accept endowments, perpetual trusts and other forms of permanent income.Just as Jeanne was recognized by her begging basket, today’s collecting Little Sisters are known by the van in which they make their daily rounds, visiting businesses and markets asking for food and other commodities to help offset our operating expenses. On weekends they visit local parishes to ask for support. They plan mailings and organize fund raising events in favor of our homes. These Little Sisters carry on the tradition of begging so dear to our foundress. In today’s economy, we must count on community support more than ever. Jeanne always thanked her benefactors by praying for them—and she thanked God at the same time. 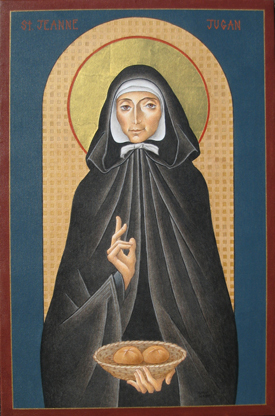 “God has blessed me,” she said, “because I always thanked his Providence… What gratitude we owe our benefactors … What could we do for the elderly without them?” Like Saint Jeanne Jugan, we recognize that our benefactors are indispensable partners in our mission. And like her, we pray for them every day!